Pesticides work a lot like antibiotics. In dilute solutions, antibiotics work selectively to rid the body of harmful microorganisms. Pesticides in dilute solutions are used selectively to rid your landscape of harmful pests and disease. Like any prescribed medicine, too much can be too much. But the right dose of pesticides, like the right dose of medicine, can nip little problems in the bud before they become big ones. You may prefer to use a natural or organic pesticide when you need to control a pest. Organic pesticides are usually considered as those pesticides that come from natural sources. These natural sources are usually plants, as is the case with pyrethrum [pyrethins], rotenone or ryania [botanical insecticides], or minerals, such as boric acid, cryolite, or diatomaceous earth. Organic pesticides are largely insecticides. Even if a product is considered to be organic, it is still a pesticide. It is important to be careful when using any pesticide, even organic or natural pesticides. Just because a product is thought to be organic, or natural, does not mean that it is not toxic. Some organic pesticides are as toxic, or even more toxic, than many synthetic chemical pesticides. Organic pesticides have specific modes of action, just as do synthetic pesticides. To determine the relative toxicity of any pesticide to humans, check the signal word given on the pesticide label. Least toxic products carry the signal word CAUTION on their label. Products with the signal word WARNING on the label are more toxic. The most toxic pesticides have the signal word DANGER on their labels. Signal words are not an indication of the potential for environmental harm. While some organic pesticides may be nontoxic or are only slightly toxic to people, they may be very toxic to other animals. For instance, the organic pesticide ryania is very toxic to fish. Also, some organic pesticides may be toxic to beneficial insects, such as honeybees, if they are combined with other materials, such as combining pyrethrins with rotenone. All pesticides, according to law, can only be used EXACTLY according to label directions. Be sure to carefully read the label of ANY pesticide you use and follow the instructions exactly as they are written. Be sure you use all pesticide products only when and where the label says they can be used. * Present no residue problems. The two types of biopesticides are biochemical and microbial. Biochemical pesticides may have a similar structure to, and function like, naturally occurring chemicals, and have nontoxic modes of action. Insect pheromones, for example, are naturally-occurring chemicals that insects use to locate mates. Man-made pheromones are used to disrupt insect mating by creating confusion during the search for mates, or can be used to attract male insects to traps. Pheromones are often used to detect or monitor insect populations, or in some cases, to control them. * Other modes of action. An example of a microbial pesticide is Bacillus thuringiensis, or Bt. Bacillus thuringiensis is a naturally occurring soil bacteria that is toxic to the larvae of several species of insects but not toxic to nontarget organisms. Bacillus thuringiensis can be applied to plant foliage or incorporated into the genetic material of crops. Bacillus thuringiensis, as discovered, is toxic to the caterpillars [larvae] of moths and butterflies. Several strains of Bt have been developed and now strains are available that control fly larvae. These can be used in controlling mosquitoes and blackflies. Please note: That is is illegal for anyone to apply restricted pesticide or regular to your lawn or shrub without being certified by the Department of Environmental and Conservation. You must also enter into a legal binding contract for the application. The pesticide company must provide label of treatment to be applied to the shrubs or lawn. 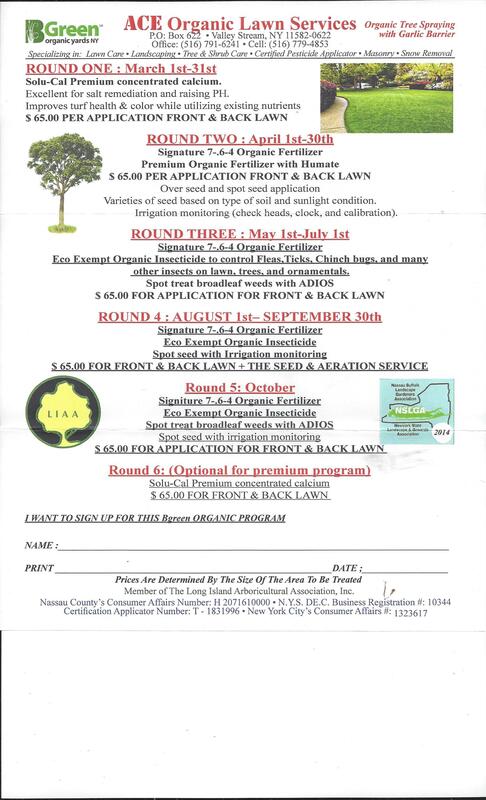 LAWN APPLICATION START @ $35.00 FOR FULL SERVICE MAINTENANCE CUSTOMER AND $45.00 FOR BASIC SERVICE PROGRAMS [request applications as we go throught the season] PRE-PAID FOR 6 LAWN [and/or] APPLICATIONS BEFORE THE 1ST APPLICATION AND SAVE 15% OFF CONTRACT PRICE.